Professor Earl Caldwell, who originally created this lecture series, invited A. Peter Bailey to take Hampton University students, faculty and staff on a journey through a period of time before many of them were even born. “I’m so happy that Peter is here tonight because he is a trailblazer. He puts the pencil to the pad and is one of America’s greatest storytellers,” said Caldwell. Mr. Bailey was an associate of civil rights leader Malcolm X. Mr. Bailey met Malcolm X in Harlem in the summer of 1962. “My roommate and I decided to walk through Harlem and we saw a crowd gathering and we asked ‘what’s going on?’ and they said ‘Malcolm X is going to speak.’ And at that time, we had heard about him vaguely and what we heard was that he hated white folks, he believed in violence, we heard all the horror stories. So we decided to stop and see what he had to say. I remember it was very hot, and there were about 3,000 people out there. By the time he finished three hours later, I was a Malcolm fan, because I never in my life heard anyone speak about race issues in America with the clarity and thoughtfulness and the commitment that he did. There were two particular things he said that has sustained me through the years: one, he told us that this whole idea that white supremacy was total nonsense. The second thing he talked about that day was tax on the mind. He spent over an hour of that speech talking about that and the movies, radio, television and textbooks. All of these things are basically a tax on the mind of people’s lives,” Bailey said. In 1963, Mr. Bailey joined OAAU, which was founded by Malcolm X, John Henrik Clarke and other Black Nationalist leaders in Harlem, New York. It was a secular institution that sought to unify 22 million non-Muslim African Americans with the people of Africa. This organization is where Mr. Bailey met Malcolm X for the first time. “Nobody volunteered to do the newsletter [for OAAU] and though I had absolutely no journalism [experience] at the time, I volunteered to do the newsletter and that’s how I became editor of the first OAAU newsletter. At the time, in New York, they were talking about the ‘White Backlash’ so we decided to call our newsletter, ‘Blacklash,’” said Bailey. Mr. Bailey also spoke about the day Malcolm X was assassinated, as he was near the ballroom where Malcolm was shot in 1965. “It sounded like a thousand shots. We ran into the bathroom, because we didn’t know what was going on, we just heard the shooting. I ran down to the stage and when I got there, Mary Kochiyama, who was a Japanese American and a member of our organization, she was there and I saw all these bullet holes in his chest and I remember thinking ‘he gonna die, he gonna die,’” Bailey said. Peter Bailey was there when Malcolm X was assassinated, and Professor Caldwell was the only reporter present when Martin Luther King, Jr. was slain. “Sometimes students don't truly appreciate the importance and historical perspective of guest lecturers because of the many distractions on a college campus, but that was not the case with A. Peter Bailey. The significance of the occasion was truly palpable. 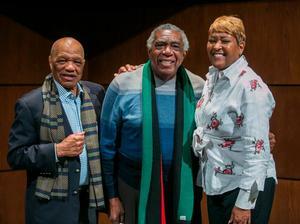 The historical importance of having the two journalists who were present at the assassinations of two of the strongest influencers on Black America was not lost on our students Tuesday night,” said B. DàVida Plummer, Dean of the Scripps Howard School of Journalism and Communications. The Hampton University SHSJC presented Mr. Bailey with a gift for his presentation and wished him a happy belated birthday. The Caldwell Cafe’, a round table discussion hosted by Professor Earl Caldwell, has taken place for more than a decade at Hampton University. Professor Caldwell invites guest speakers that are leading the media industry in journalism, public relations, and leaders who have paved the way for African-Americans nationwide. The Cafe’s guests include notable trailblazers such as Edward Lewis of Essence Magazine, news connoisseur Bernard Shaw, Kenneth Walker and Judy Clabes, former CEO of the Scripps Howard Foundation. The Cafe’ is known around campus for its real, raw and relevant discussions.